1. What do I get on a half day trip? We supply all equipment including rods, reels, waders and boots. All you pay for extra are your flies used by the guide and your licence for the day. Obviously if you have a current Colorado licence you are good to go. You may also use your own flies as well if you want to. In addition if you have your own equipment you can use that as well. 2. What do I get on a full day trip. In addition to all equipment provided on the half day wade, on a full day trip we also supply a lunch. 3. What do I need to bring on my trip? You should also bring, a hat, sunscreen, polarized sunglasses and a wet weather rain jacket if there is a risk of thunderstorms or rain. 4. On a float trip what do I pay for? Apart from paying for flies and your fishing licence, you will discuss the shuttle arrangements with your guide. Each guide has different shuttle arrangements. The shuttle is necessary to move the vehicles to the take out point while you are floating. Normally a float trip is for 8 hours but this year in view of the lower water there may be restrictions imposed by the DOW on what times one can be on the water. This may reduce the time. You will discuss this with your guide. 5. On a float trip can I take along a spinning rod? Yes. Sometimes a fisherman might not have the facility to cast a flyrod all day so there is no problem taking a long a spinning rod. Younger people and children who are not strong fly fishermen can also enjoy a trip more if they can cast a lure or a streamer on a spinning rod. 6. How do I book a trip? A credit card is required to make your reservation for a Basalt or Aspen guided fly fishing trip or your Colorado or Roaring Fork float trip. You may phone us to book or use the trip order form. Should you decide to cancel your trip, we require at least 48 hours notice. If you don't give us 48 hours notice, we will charge you a fee of $200. Understand that our guide booked for you will have missed out on a trip therefore they have to be compensated for the lost trip, hence the fee. However if the waters are up and our guides consider that the fishing won't be good they will cancel or postpone without charge to you. 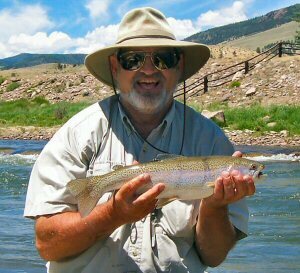 We want you to have a great experience on your Basalt or Aspen guided fishing trip and your Colorado or Roaring Fork float trip. Meet some of our guides here.